The index finger (also referred to as forefinger, first finger, pointer finger, trigger finger, digitus secundus, digitus II, and many other terms), is the first finger and the second digit of a human hand. It is located between the first and third digits, between the thumb and the middle finger. It is usually the most dextrous and sensitive finger of the hand, though not the longest – it is shorter than the middle finger, and may be shorter or longer than the ring finger – see digit ratio. "Index finger" literally means "pointing finger", from the same Latin source as indicate; its anatomical names are "index finger" and "second digit". The index finger has three phalanges. The index finger does not contain any muscles, but is controlled by muscles in the hand by attachments of tendons to the bones. A lone index finger held vertically is often used to represent the number 1 (but finger counting differs across cultures), or when held up or moved side to side (finger-wagging), it can be an admonitory gesture. With the hand held palm out and the thumb and middle fingers touching, it represents the letter d in the American Sign Language alphabet. Pointing with index finger may be used to indicate an item or person. Around the age of one year, babies begin pointing to communicate relatively complex thoughts, including interest, desire, information, and more. Pointing in human babies can demonstrate the theory of mind, or ability to understand what other people are thinking. 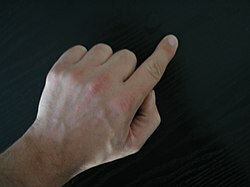 This gesture may form one basis for the development of human language. Non-human primates, lacking the ability to formulate ideas about what others are thinking, use pointing in much less complex ways. However, dogs and elephants do understand finger pointing. In some countries, particularly the Ethnic Malays in Malaysia, pointing using index finger is rude, hence thumb is used instead. In the Netherlands sticking up your index finger with your palm faced towards someone is a greeting. In Islam raising the index finger signifies the Tawhīd (تَوْحِيد), which denotes the indivisible oneness of God. It is used to express the unity of God ("there is no god but Allah"). The gesture has recently become widespread among supporters of political Islam and jihad, particularly members of ISIL. In Arabic, the index or fore finger is called musabbiḥa (مُسَبِّحة), mostly used with the definite article: al-musabbiḥa (الْمُسَبِّحة). Sometimes also as-sabbāḥa (السَّبّاحة) is used. The Arabic verb سَبَّحَ - which shares the same root as the Arabic word for index finger - means to praise or glorify God by saying: "Subḥāna Allāh" (سُبْحانَ الله). The Romans used the forefinger while fighting because the index finger asserted that the enemy was in front of them. As an artistic convention, the index finger pointing at the viewer is in the form of a command or summons. 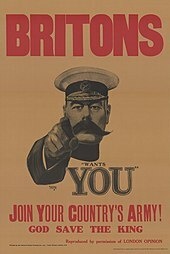 Two famous examples of this are recruiting posters used during World War I by the United Kingdom and the United States. The index finger pointing up is a sign of teaching authority. 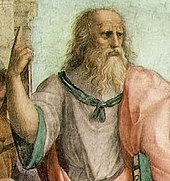 This is shown in the depiction of Plato in the School of Athens by Raphael. ^ "forefinger - definition of forefinger in English | Oxford Dictionaries". Oxford Dictionaries | English. Retrieved 2017-06-08. ^ "first finger - definition of first finger in English | Oxford Dictionaries". Oxford Dictionaries | English. Retrieved 2017-06-08. ^ Gary Imai. "Gestures: Body Language and Nonverbal Communication" (PDF). Archived from the original (PDF) on March 31, 2010. Retrieved 12 November 2009. ^ Day, Nicholas (26 March 2013). "Research on babies and pointing reveals the action's importance". Slate. Retrieved 25 April 2013. ^ a b Kirchhofer, Katharina C.; Zimmermann, Felizitas; Kaminski, Juliane; Tomasello, Michael (2012). "Dogs (Canis familiaris), but Not Chimpanzees (Pan troglodytes), Understand Imperative Pointing". PLoS ONE. 7 (2): e30913. Bibcode:2012PLoSO...730913K. doi:10.1371/journal.pone.0030913. PMC 3275610. PMID 22347411. Lay summary – Science Daily (February 8, 2012). 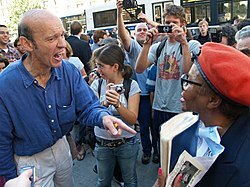 ^ Goodman, M.; Sterner, K. N.; Islam, M.; Uddin, M.; Sherwood, C. C.; Hof, P. R.; Hou, Z. C.; Lipovich, L.; Jia, H.; Grossman, L. I.; Wildman, D. E. (2009). "Phylogenomic analyses reveal convergent patterns of adaptive evolution in elephant and human ancestries". Proceedings of the National Academy of Sciences. 106 (49): 20824–9. Bibcode:2009PNAS..10620824G. doi:10.1073/pnas.0911239106. JSTOR 40536081. PMC 2791620. PMID 19926857. Lay summary – Wired UK (October 10, 2013). ^ a b Drißner, Gerald (2016). Islam for Nerds - 500 Questions and Answers. Berlin: createspace. p. 521. ISBN 978-1530860180. ^ Zelinsky, Nathaniel (3 September 2014). "ISIS Sends a Message: What Gestures Say About Today's Middle East". Foreign Affairs. Archived from the original on 12 August 2015. ^ Brusati, Celeste; Enenkel, Karl A. E.; Melion, Walter (Nov 11, 2011). The Authority of the Word: Reflecting on Image and Text in Northern Europe, 1400-1700. Brill. p. 168. ISBN 9004215158. Look up index finger or Wikisaurus:index finger in Wiktionary, the free dictionary.